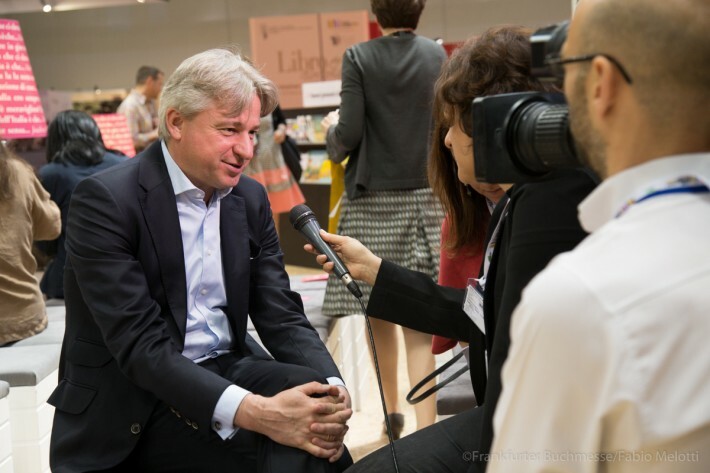 Frankfurt Book Fair director Juergen Boos spends much of the year traveling to ensure that the best of global publishing is represented at the Fair each October. This article first appeared in Publishing Perspectives’ 2015 Global Publishing Magazine. Download and read the magazine here. You can think of Boos as the book world’s version of super art curator Hans Ulrich Obrist. With his trusty, but battered aluminum Rimowa suitcase in hand, you’re just as likely to run into Boos at an event in Buenos Aires or Beijing, London or Lima, where he is a sought-after speaker and expert on global publishing and media trends. In fact, you’re more likely to find him abroad than in Frankfurt itself, as he spends more than half his year on the road. Frankfurt is, at its heart, all about stories. In this regard, it is a place for connecting local stories to the broader global community, whether that is through exhibitions, the Literary Agents & Scouts Center, or the Guest of Honor program. So, like the best curators, Boos, too, has proven an eye for curious and rich contrasts, all in the service of inspiring dialog, discussion, and dealmaking.